Now that the track is live, I think we can open this thread for suggestions. I'll try to be as condensed and constructive as possible. Last edited by Queadah on Mon Jan 02, 2017 3:42 pm, edited 1 time in total. Can we get an alternate route (or even a main route) that goes through a tunnel under the water? Also, when finished I think the track should have a lot of vegetation like trees, and even brush and grass over the track in places if that is doable. 1) It is possible to get stuck up here on the glass wall. 2) I think this tunnel should be reskinned to look more like the tunnels in Transport than the tunnels in Yuri. I'm not sure it makes sense to share such distinct resources between planets. 3) Really weird things can happen if you fall off at this point. I'm not sure what to suggest as a solution. The Islands track was included in the update strictly for gameplay reasons, so most of the art assets in the level are placeholders. kingbeandip wrote: Can we get an alternate route (or even a main route) that goes through a tunnel under the water? Also, when finished I think the track should have a lot of vegetation like trees, and even brush and grass over the track in places if that is doable. We already have jungle assets ready to go, but doing an underwater section is not only a giant artistic feat, but also technical, trying to separate the different atmospheres. To me islands currently reminds me of an upmarket holiday resort (and i don't know why). It is just missing some nice foliage, nice (tiny) beach loungers and some places for other activities like sports as well as some nice yachts. Hosting a GRIP race there surely would be a publicity stunt . lol why not. I've no solid opinion on the background story of that Island map. kingbeandip wrote: 2) I think this tunnel should be reskinned to look more like the tunnels in Transport than the tunnels in Yuri. I'm not sure it makes sense to share such distinct resources between planets. It both kills immersion (less identity) AND looks a little bit cheap (don't mean to be rude by that) to use the exact same large assets regardless of the track. That tunnel will use a cave asset, no worries. The new one on the right side (more of a wall ride), right of the boosted jump in the middle of the road, after the U turn. On the right upper path. The left side routes write down a bigger radius around the track, therefore longer and slower than the rightmost one. The multiple ways ain't a bad idea, since it creates the opportunity for each route to cater to different types of classes. The present optimal route could be quilt with a bit more turns and obstacles, so the speedster classes would get the advantage here. The left side ones could get more speedpads, which would be benefical to the tank class with their already higher top speeds, so the longevity wouldn't be that much of a problem anymore. I know that it might be for the later, but I do agree on the idea, that the water slow the cars down, and I might add aquaplaning effect as well. I love that Islands has multiple routes and visually it's a strong map. Despite this, it's very boring to drive on. 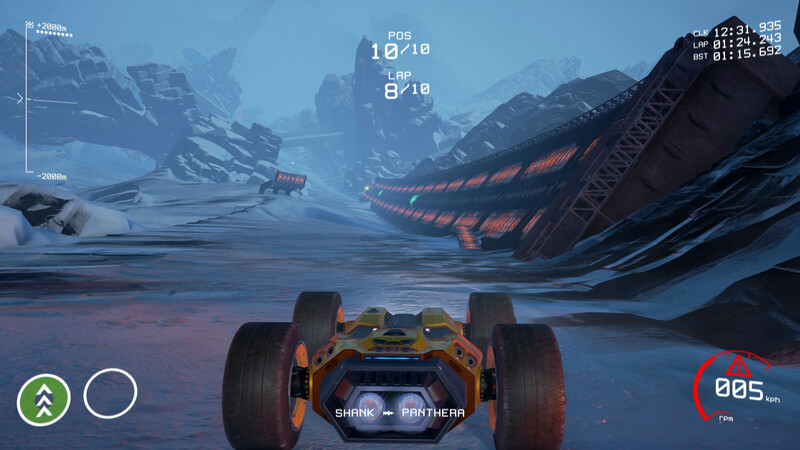 The track is quite flat, very wide, has long stretches of driving straight ahead and there's barely any corners that actually require the player to tilt their analog sticks more than 5 degrees. On top of that the routes tend to separate the racers too much. The piece before the finish line is very nice, but before players actually get to those bridges, they get split up into three paths, of which at least one is completely useless as it adds a massive detour. Worst case scenario you end up with just 1 person on a path who's seperated from the rest of the group for at least 15 seconds. 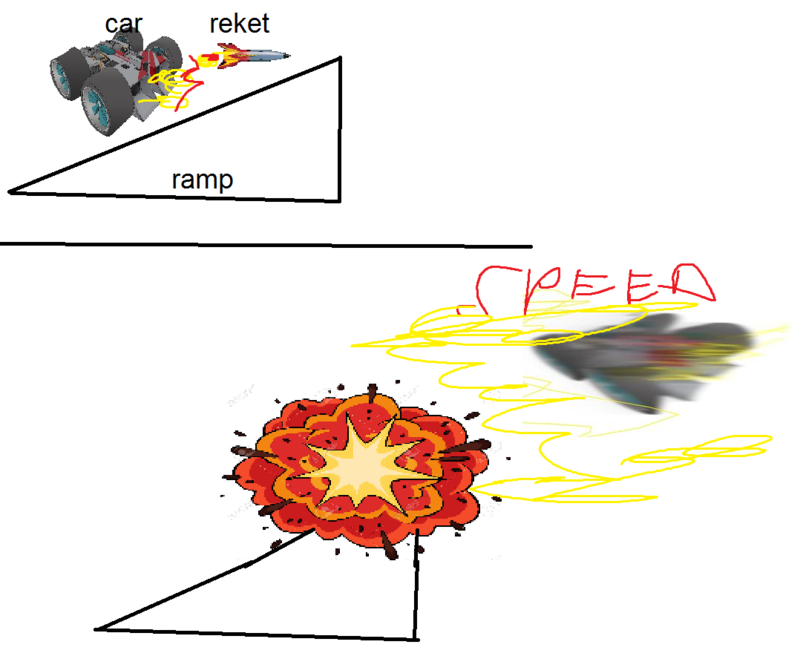 If it's intended to be the easiest track in the game, feel free to disregard my feedback, but personally I'd redesign the sh*t out of this track. It's filled with nice bits of design (split corner at the start, driving underneath a tree, the glass tunnel, the multiple bridges before the finish line, driving by the seashore), but they're all just a big waste in this layout. Heck, shove it all into Sky Track 1. That track is infinitely more fun to drive on and I'm sure far less time was spent on creating that. Broscar wrote: Heck, shove it all into Sky Track 1. That track is infinitely more fun to drive on and I'm sure far less time was spent on creating that. Creating that track with gameplay first in mind is clearly the right direction they should take. This is the funniest track of all and it's visually not even completed. The difficulty balance is just perfect and hitting those small barriers for jumping require skill and focus... I love it! Last edited by twisted on Tue Jan 03, 2017 11:53 am, edited 1 time in total. Broscar wrote: I love that Islands has multiple routes and visually it's a strong map. I didn't think about it until now, but I think Broscar nailed it. That explains why I almost never drive on that track. I'm going to play it again and figure out where I think it can be improved. Until then, I think adding obstacles (such as rocks, buildings), foliage (large trees), buildings/structures, and more verticality, could all improve the track. Also, there may be a bit too many alternate routes; one or two could be trimmed down, removed, or changed to not stray from the main spline too much. Did a few runs on the Island track as per requested by Chris for feedback on flow. Prior warning: Adjust your volume. There are a few unexplained Discord notification pings from people sending me friend requests, and they're loud. (Race #2 unfortunately didn't record). Had a few rough collision problems in the first race, less-so in race 2. I don't know the track that much (I've driven it once since it was updated ) so this could be considered a 'blind run'. It also depends on what the intended difficulty is meant to be as to what I can suggest as far as flow and design, although I could say that the 'core' flow of the level is perfectly fine. Lots of long jumps, driving on the undersides of the roads is fun. Broscar's comment about there being very many routes that at high-end play are going to be useless concerns me a little, because yeah, aside from the 'choke points' of the track (namely the glass tunnel and the final bridge) I was only seeing two, three cars at any one time. Then again, I'm under the impression that this is a beginner's track, so splitting the cars up like that can end up serving to help newbies survive (having a much easier/safer but slower route vs the other paths that are faster but will ruin you for messing them up. I'm tempted to echo that some parts of the track feel too big/flat, though. The section after the first corner/wallride and up to the glass tunnel, for example, just feels like it shouldn't take as long as it does. 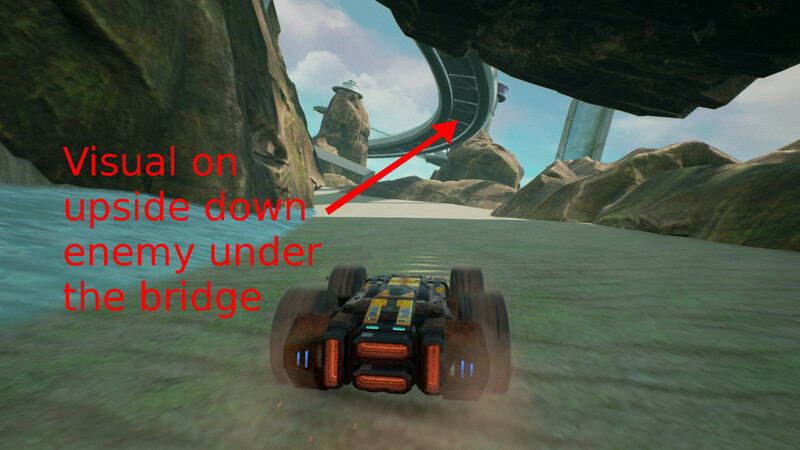 In a way I could say the dunes section does too, but I don't know if that's something that can/should be changed or is intentional (for making the track easier to understand/drive). 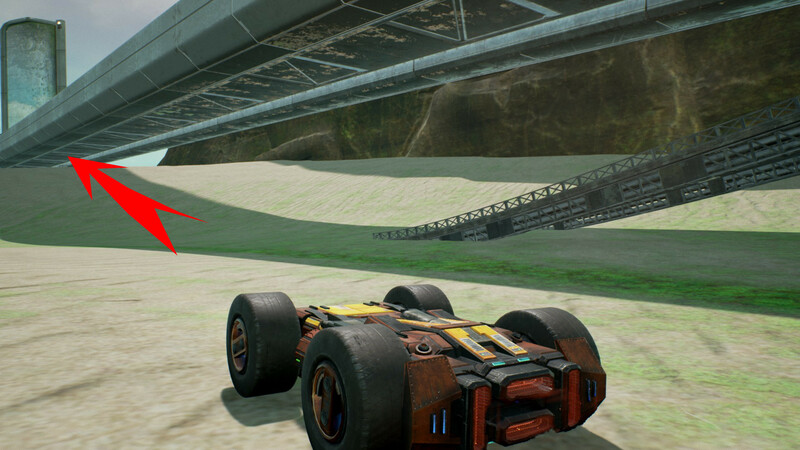 I mean, something as simple as making the bridges more interesting visually (or flow-wise) could change that, since driving across them feels like a loading screen (no offense, it's just an analogy xD). Definitely, some sort of visual aid should be added for spotting the ramp onto the bridge at the end, because as you'll see in my videos it's hard to really judge where the road through the buildings is until you're right up on it. I'm not saying the whole dunes section itself is terrible (nope), just that I'm having a hard time finding a reference-point to drive towards in that section. Main point: The track works, the routes are all different, and the majority of it is keeping me focused. 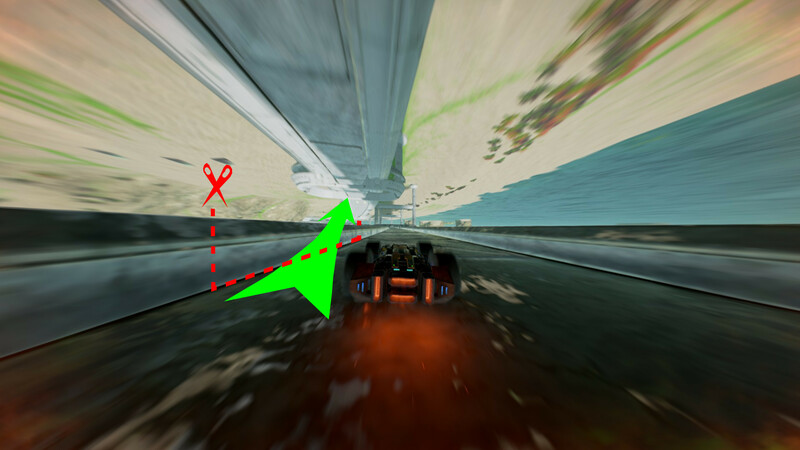 VooDooQky wrote: The left side routes write down a bigger radius around the track, therefore longer and slower than the rightmost one. The multiple ways ain't a bad idea, since it creates the opportunity for each route to cater to different types of classes. It's longer, not slower. You'll be having a much higher speed in overall on that outer path, while on the beach, yes, it's shorter, but your speed will be significantly lower on average. Heck, entire bridge with Warlander is done at about 558km/h, while on the beach part I'm barely reaching 530km/h. On top of that you can easily balance this out by adding a speedpad there or two. Try testing it thoroughly, recording really fast clean runs on both and then see what's what. I personally suggest from such a thing to start at the starting gate and end at the end of the glass tube. Anyway, personally I think the flow is perfect. The only things need adjusting are small things like ramps, speedpads, pillars. Those that I find the most problematic can be seen in the video below. 0:00 - That speedpad there is kind of left to be found by an accident. On top of that it doesn't even point in the direction of the bridge, which makes it even more pointless. Maybe move it to the most outer route? 0:08 - I find that ramp to be positioned very... surprisingly. You just don't expect it to be there and have to alter the line to get it there quite a bit. By the time you notice it's there it's really hard to get it turned into it while not having a Speeder class car. On top of that those barriers on it like to throw the car, as seen on the video. Those are pretty much the only issues I have with the flow in general. Everything else is quite literally more of a cosmetic change rather than an actual issue/improvement for the flow. I made perfect timetrial rounds without pickups on dominator and the results were worse by an average of 3 seconds, starting from the rightmost route, switching to the left after attaining the best possible time on each route. So to say the rightmost line was slower by 6-7 seconds, from the record. 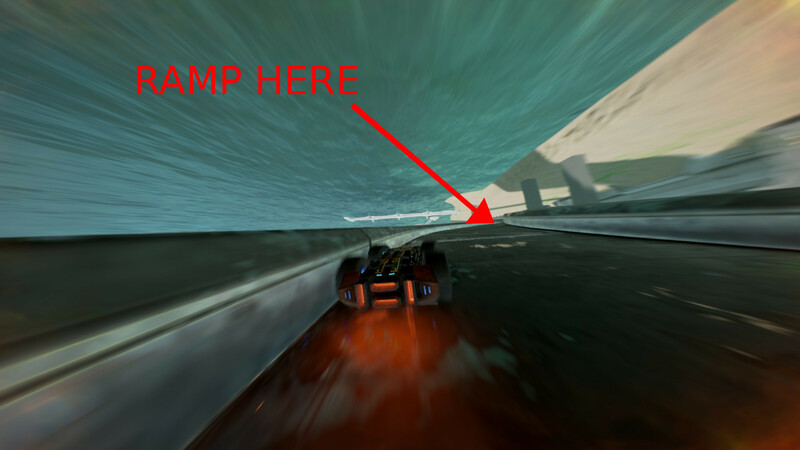 Ryu Makkuro wrote: 0:08 - I find that ramp to be positioned very... surprisingly. You just don't expect it to be there and have to alter the line to get it there quite a bit. By the time you notice it's there it's really hard to get it turned into it while not having a Speeder class car. You want the track to be even more easier? Having to brake a little to get on that ramp and to benefit later on of the speedpads is called balance. Aside from that, there's no turn really that require any skill which is disappointing, it's just pedal to the metal to whole way. I like that on Alhatra Waste (the night one) we have to use braking on some turns, it adds some difficulty. Aside from that, I agree with everyone that the track is generally too wide but I think it make it a different experience and look. I would like to experience it's flow with shrinked straight and turns (some are too long) and added obstacles and elevation changes. I think it would be a whole different experience. VooDooQky wrote: I made perfect timetrial rounds without pickups on dominator and the results were worse by an average of 3 seconds, starting from the rightmost route, switching to the left after attaining the best possible time on each route. So to say the rightmost line was slower by 6-7 seconds, from the record. Well, there you have it. Dominator is not a top speed oriented car so naturally it will benefit from a shorter route that is twistier, rather than a longer that is top speed oriented. Tips for future. If you test something, either test it with speeder and tank, or use the middle one. twisted wrote: You want the track to be even more easier? Having to brake a little to get on that ramp and to benefit later on of the speedpads is called balance. Aside from that, there's no turn really that require any skill which is disappointing, it's just pedal to the metal to whole way. I like that on Alhatra Waste (the night one) we have to use braking on some turns, it adds some difficulty. Aside from that, I agree with everyone that the track is generally too wide but I think it make it a different experience and look. I would like to experience it's flow with shrinked straight and turns (some are too long) and added obstacles and elevation changes. I think it would be a whole different experience. Also, the whole point of this track is to be wide. You don't want uber wide? You have a lot of tracks that can cater to that. There's no track that gives you as much space to play around as this. The experience you're looking for sounds pretty much exactly like Yuri Industrial. I for one enjoy a lot the fact it gives so much space to play around. @Ryu Makkuro Maybe I wasn't clear, I said the fact it's wide make it a different experience and look which I like but that it's generally a little too wide. I also wrote some turns and straights are too long, not large.